The Ayam Cemani is an enigmatic and mysterious breed that originates from Indonesia. It is a medium size breed with a sleek streamlined appearance not dissimilar to that of the wild red junglefowl. However, unlike the wild red junglefowl it is completely jet black; from it's feathers, nails, skin, beak, eyes, flesh, bones and even it's tongue. Good specimens that are completely black are believed to have magical powers, so are much sought after in their native land. Cemani are the most prized forms and believed to be used in local animist rituals. It is not uncommon for Cemani to throw white skinned or partridge as these are sometimes crossed with different Kedu forms. However only the completely black birds are referred to as Cemani. 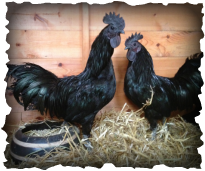 It is very likely that the ayam Cemani are derived from the "ayam Bekisar". Ayam Bekisar is the Indonesian name given for a 1st generation hybrid between the male green jungle-fowl (Gallus varius) and female domesticated chicken or red jungle fowl (Gallus gallus). Ayam Bekisar, pertains specifically to the male offspring from the cross of the red and green jungle-fowl species. The female hybrids are infertile and indeed many 1st generation males from these crosses are often also infertile. The Ayam Bekisar hybrids are much valued by Indonesians and Oceanic cultures for their crowing. They were originally used as a form of forgone by ancient Austronesian boat cultures. They served as hardy canoe mascots where their distinctive and often unique crows could be heard from several miles. Their deeper crow are sometimes described as a roar and can be heard over long distances and in poor weather. These allowed ancient mariners to remain in vocal distance and even identify the vessel by the different crowing voices, some are said to be almost human in quality. Ayam Bekisars have been largely supplanted by ayam Pelung (an Indonesian native long crower), which is almost certainly also descent from Ayam Bekisar. However the tradition of using chickens on some Indonesian fishing boats still remains. Indeed some provinces regularly host crowing competitions with birds hoisted in cages over tall bamboo posts. Some of the most ancient breeds like the Japanese Long Crowers, the Black Sumatra and all of the archaic Oceanic breeds (e.g. Rapanui/Olmec from Easter Island and ancient chickens found in south America) are said to be derived in part from Ayam Bekisar ancestors. They were taken by the Polynesian and Melanesian sea farers and form distinctive races or populations of chickens across Oceania. It is extremely likely that the black skin, flesh and internal organs of the Ayam Cemani originates from Ayam Bekisar ancestry. One of the common morphs of these crosses are chickens with black skin, flesh and organs. The ayam Bekisar is a very ancient cross and it's precise history is unclear. Most Indonesians believe it to have first discovered by people living in Kangean Islands (a group of tiny islands just East of the main Java island). Ayam Bekisar still remains popular in that area and is the mascot for the province of East Java. Back crosses of the Ayam Bekisar back to the green jungle-fowl have been proved by several studies to be unlikely due to chromosomal mismatch of the hybrids. The hybrids are often sterile with only some males being capable of breeding with domestic hens and producing offspring. So they would have been further crossed with red jungle-fowl (i.e. away from the green jungle-fowl). Solid black birds with other dark feature were progressively selected over time to create a completely black bird with a ghostly appearance that we know as the ayam Cemani. When and where exactly this was done and by whom is unclear, but in the 1920's Mr. Tjokromihardjo from Grabag, Magelang was documented as the major founder of the current breed and his sons and their descendants carry on the tradition today of keeping the breed alive. The breed was imported into the Netherlands around 2000 and has been gradually spread across Europe.